Medical care is important for treating your injuries. What you might not know is that seeking medical attention after an accident serves a second purpose – it documents the severity of your injuries and the extent of your medical treatment. Insurance companies consistently argue that your injuries are not as serious as you claim to avoid paying you what you deserve. By seeing a doctor, your medical records provide a valid and verifiable record for your case. Finding the right doctors to treat you for your Maryland Personal Injury Claim can be complicated. If you need help selecting a doctor in your area, the Law Office of LaSheena M. Williams, can connect you with several qualified medical professionals with experience diagnosing and treating accident injuries. We will help you obtain medical care for your current pain, and for any long-term problems that result from your claim. We can work with your personal injury protection (PIP) medical coverage or your medical provider to extend bill payment until your case is resolved. Accidents can cause severe injuries that may keep you out of work for an extended time. 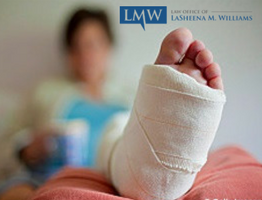 At The Law Office of LaSheena M. Williams‚ we fight to get you compensation for any lost wages that result from your accident. If you are unable to return to work due to your injury‚ we will help you seek additional compensation for future lost wages. We will not let someone else’s negligence prevent you from supporting yourself and your family. Unfortunately, we cannot prevent you from enduring the physical, mental, and emotional fallout from you Md Personal Injury Claim. However, we can help you seek and obtain compensation for the pain you experienced and the suffering the injury has caused you and your loved ones. The accident interrupted your life. At the Law Office of LaSheena M. Williams, LLC, our role is to help you fight for justice and secure the compensation you need to make things right. Your case belongs in the hands of a personal injury lawyer who puts clients first and who is not afraid to fight for your rights. At The Law Office of LaSheena M. Williams‚ we pride ourselves in developing personal relationships with our clients and we go the extra mile to take care of their needs. We have handled personal injury cases of all kinds and recovered large settlements or verdicts for victims of car accidents, slip and falls, and other types of accidents throughout Maryland. Contact a Maryland Personal Injury attorney today at (301) 778 – 9950 for your confidential consultation. 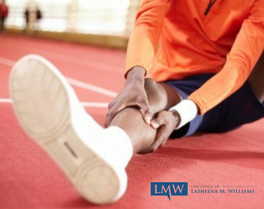 To learn more about receiving compensation for your Maryland Personal Injury Claim, contact the Law Office of LaSheena M. Williams. We can help you understand your rights and protect your interests in a Maryland Personal Injury Case. Contact us by calling (301) 778 – 9950 or by completing an online request for a consultation.